The Bulfinch State House was completed on January 11, 1798 and was widely acclaimed as one of the more magnificent and well-situated buildings in the country. Its dome dominated the Boston skyline until the advent of the skyscraper. In 1713 the seat of the Massachusetts government was the old State House at the corner of King (now Washington) and State streets. The site chosen for the new State House, close to the summit of the south side of Beacon Hill overlooking Boston Common and the Back Bay, originally served as a cow pasture for the Revolutionary patriot and governor John Hancock. Charles Bulfinch was chosen to design the building. He later contributed to the plans of the Capitol in Washington. 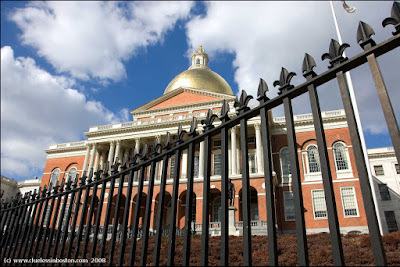 More information on this week's posts about the Massachusetts State House can be found here. Great shot of a magnificent building! It would be nice to see a couple of shots of the interior, if they allow photography inside (?). Pat: thanks for your comments. Beantown: Yes, it is a magnificent building and they do allow photography inside! I have a few I am going to post this week. The angle is very original! I love it! Beautiful photo! Wow That's a stunning photo. I echo everyone: perfect angle and colors. And the gold under the blue sky is amazing!! Great post!! What an interesting angle! Loving the colours, too! Thanks for visiting Norwich Daily Photo and for leaving your comments. How was the start to your week?